Just a few weeks before the start of the Leaving Cert Orals, join to practise your French with a native qualified French teacher! The French Oral examination makes up 25% of the grade at Higher Level Leaving Certificate French. It is important to feel prepared and confident in order to maximize the chances of getting a higher mark. Join our intensive French Oral Day to feel confident and prepared for the exam! 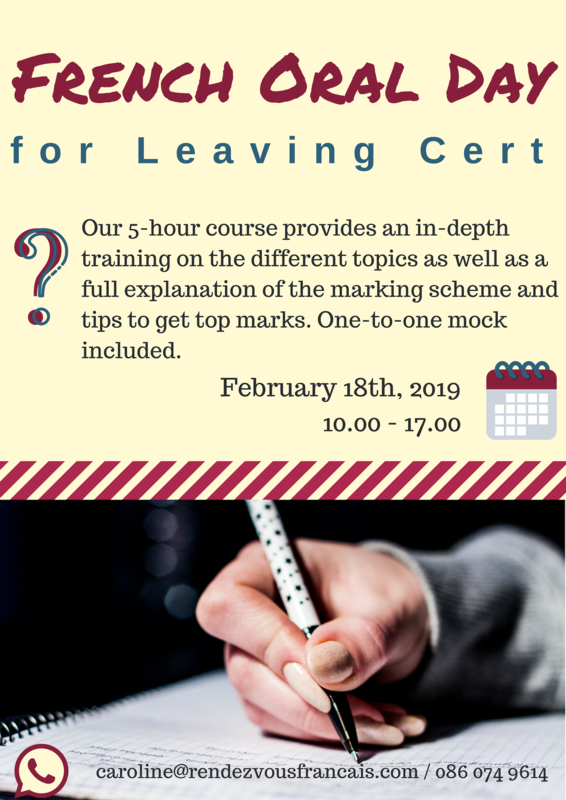 Our 5-hour course provides an in-depth training on the different topics as well as a full explanation of the marking scheme and tips to get top marks. Learn how to develop your answers, lead the conversation and personalise your answers. Work on your pronunciation and on the most common grammar mistakes. Have a one-to-one mock oral exam and get feedback with an experienced teacher. The fees to attend the course are 70€. Fees include tuition, mock oral, and course notes so that students can continue their preparation at home before the exam.